We received the following letter a few weeks ago. While long, we felt it was a good personal observation and summary of the many reasons the proposals laid out for the Parkway Corridor are just simply bad ideas. 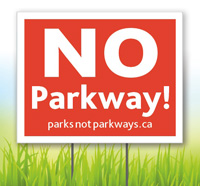 Having read much debate about the proposed Parkway, I feel compelled to submit my point of view on the matter. I was born and raised in Peterborough, and resided there for 25 years. My family has lived here since around 1912. Due to my career I now live in Kitchener Ontario, but have invested in property in Peterborough and still frequent the area. Myself and my family continue to vacation in Peterborough every year, and also visit very frequently with friends and family in town. Now, the push is on to forever destroy one of Peterborough’s finest resources, one which other communities great and small would be envious of and fight to the end to preserve. While cities and towns all over Southern Ontario are spending tens of millions to claw back their green spaces, are narrowing roads to reduce vehicle traffic and promote alternate means of transportation, and renewing existing aging infrastructure in order to accommodate future generations, Peterborough council is stirring up debate on a project that was considered obsolete half a century ago and creating division in the community in the process. I have watched, listened and read with great interest over the years on this subject, but to date have not found one valid and solid argument that supports this project. I will list the more popular reasons that come I’ve heard, and explain the faulty logic behind each one. I can only assume those who would make such a statement have never ventured outside of Peterborough in their lives. If they had, they would know how ridiculous such a statement is. In Kitchener, it can take me more than 15 minutes just to get out of my neighbourhood. To date, nobody has died from this. Why? Because sufficient infrastructure is in place to ensure emergency services and service sub-stations are strategically placed and available. The Peterborough “Rush-Minute” traffic is a joke. I have been on many arterial roads in Peterborough at high volume times and days, and could often fire a cannon down the middle of them and not hit anyone. Peterborough does not have a traffic problem. Coordinating traffic lights properly however could shave a great amount of time off cross town travel, and cost far less. Additionally, we do already have an arterial route. It’s called Parkhill Road, Water/George Street, and Monaghan road. A quick glance at a map shows the north south route of the Parkway is already redundant as it merely parallels an existing underutilized route. If this route is not fast enough, it can be retrofited to work. If Peterborough “NEEDS” this, then surely nobody will mind if the houses that line Parkhill are removed and Parkhill is made 4 lanes throughout. After all, this is part of the original city plan. Parkhill was the arterial north boundry highway intending to connect Peterborough to outlying locations, as was Water/George as a north/south route. It was for this very reason that the Parkhill bridge over Jackson Creek was built to 4 lanes when the rest of the existing road was only 2 lanes. Such a route would not only work, it would also encourage very badly needed travelers and money into the downtown core. Parkhill (originally “Smith Street”), was intended to function north of the city the same way Lansdowne does to the south, connecting east/west with north/south arteries such as George/Water, and Monaghan. Arguably, These can still be made to function as intended at equal or less cost than the Parkway. I say arguably, because council has never published cost information or environmental impacts of any plan other than the Parkway, no alternative has been considered or offered to the tax payers. Finally, if it the claims that it takes 15 minutes to get across town are accurate, with the hospital being central, it means the hospital is 7.5 minutes away from any area within the city limits. This is not only an acceptable distance, it is considered ridiculously close and convenient by any other municipal standard. The Parkway route was actually deemed to be redundant and abandoned half way through the last century. Wise leadership knew then, (as can be clearly seen now), that the town was not developing at the rate or direction originally anticipated. Since then, some legacy-seekers have squandered much needed money on surveys and studies just in case they could find a way to justify its construction despite the majority of the population having voted it down repeatedly. Each time previously it was determined that it was not the right solution. The last vote on the matter by the public in recent memory voted it down once again, but council pushed on. There is at least the perception that Council will push forward with this regardless of what the community wants. And it appears that they have finally found a firm to “recommend” what they have already decided to do some time ago. The decision has already been made, now they just need to make it appear to be the right one. As I mentioned above, the main route is Parkhill and Water/George. Expand those instead, if in fact it is needed so badly. Those who are sick of hearing about the “tree huggers” surely will lodge no objection if the route was changed to run through their own back yards, or to pave over their homes instead. Cumberland and Hilliard were also intended to be arterial, with Hilliard being a direct route to Bridgenorth (part of it now closed), and Cumberland already built wide enough since it was intended to be arterial from the day it was built. These need to be your main routes, if in fact it is needed so badly. Cumberland traffic could be re-directed to take a short jog north and over existing road to Chemong, and could even be extended beyond that well past the west end limits. If a fast route is so badly needed, existing infrastructure could be upgraded to create an easy east/west and north-east-west express route. While the “tree huggers” are absolutely correct in not wanting Jackson Park or the recreational land along the Parkway route destroyed, do not let their arguments appear as the only objection. The fact is, the Parkway project makes no economic sense. If we want to stick to the city plans, Monaghan also needs to be 4 lanes all the way through. In fact, so does Tower Hill Road, Lilly Lake Road, and the top end of Fairbairn. Provisions were laid out for a parallel road to Chemong in the original plan, that made a straight line from Fairbairn to connect with the top of Monaghan road completing a direct north/south artery west of the park, so we need to rip down all the housing west of the park to make that happen also. It was in the original plan after all, although some people who have been influential in pushing the Parkway do own property that would be impacted by such an expansion, so it’s understandable why they would prefer to see other people’s property plowed under instead of their own (even though they chose to live on known existing arterial routes, unlike many who now face having a previously cancelled highway in their back yard). Now, the idea of 4 lanes was not in the original city plan, but neither was the volume of cars we see today. In fact cars weren’t in the original plan at all. So perhaps then we should go back to horses and buggies, since the original plan is supposedly infallible, and if it was the plan once it must surely be applicable today. But once again if we truly “need” this, these already existing roads which were intended to be the arteries, can and should be made to serve the primary purpose they exist for. I’m sure nobody there will object…. Or, perhaps those who “Need” this route only need it so long as it destroys someone else’s property value and not theirs. So either we return to horses and buggies, or we must concede that even if the Parkway was once in a former version of a plan for the city, plans do change, and the city hasn’t at all developed as anticipated when the Parkway was first formulated. The route of the Parkway is the remnant of a municipal plan that was obsoleted years ago, when it was assumed the main development would follow along the Otonabee. The development has in fact not taken that path as much as was anticipated, but is now spreading mostly WESTWARD. This means The Parkway project as proposed, will be finished just in time to be completely redundant and provide no benefit at all to the fastest growing area of the city. Additionally, one of the largest areas of Peterborough, East City, will reap no benefit from the Parkway at all, have no decreased time to the hospital, but be saddled with the tax bill just the same. If anything, a West-South route is needed with improved East/West access via Parkhill, not a North-South route that will cater to a select few at the expense of everyone. Peterborough is not growing as fast as many other communities. I can only think of less than 10 people I grew up with who stayed in Peterborough. Like myself, the rest were forced out in pursuit of meaningful employment. Property values in Peterborough are well behind the averages, this is a simple function of supply and demand. Evidence that people are not flocking to Peterborough. Many who grow up here however are leaving in ever increasing numbers. The Parkway is a long term project, so we have to address the demographic in the long term. One unfortunately morbid fact is in 20 years, the largest segment of the current population will either be no longer driving, or simply no longer with us. The population behind them is not increasing at previous rates, many people today have one child or no children at all, where even 20 years ago 2 or more children was “standard”. Even fewer still of those children who grow up in Peterborough will stay in Peterborough, because the employment infrastructure is not sufficient. What this means for Peterborough is a decline of youth and families, with the only potential growth segment being retirees or commuters. Those who want it today will not be around to reap it’s benefit, and generations to come will be burdened with its cost. Once this is built, there’s no going back. Quite the contrary. The green space makes Peterborough attractive. As it sits today Peterborough’s worst traffic ever couldn’t even equal a normal trip to the grocery store in many other established communities the same size or larger. The idea of trading the green space for saving a couple minutes across town is insane (and also inaccurate, given the number of traffic lights scheduled along the route). The Parkway is not needed today, and the present day traffic situation confirms this. It won’t be needed in the future, because development is headed in an entirely different direction. It is for this very reason that Cumberland, Monaghan, and Parkhill were NOT made into highways, and the very reason why the Parkway itself was obsoleted half a century ago… because it is not needed. This has been confirmed time and time again after multiple redundant (and expensive) studies. In any case, for any of these routes, decisions were made to move away from these plans and infrastructure was built accordingly, the window of reasonable opportunity on the Parkway is well passed. Furthermore, the Parkway will certainly cause Peterborough’s already struggling real estate prices to plummet. Nobody wants to live beside a highway. Take a look at how many residential properties line the Parkway route. Every single one of them can expect an immediate depreciation; some would suggest a range of 20-30%. Do the math, this is staggering. A quick study of any area that lines such a highway route shows that those areas decline and deteriorate, which means as the road is put in, the surrounding areas will decline very quickly and what were once beautiful neighbourhoods will become what real estate professionals dub “undesirables” in short order. When that happens, assessment values will also fail to keep up and the taxable base for a significant number of properties in the city will begin to shrink against inflation. I’ve seen no provisions for this in any city financial plans so far. This drop in value won’t happen once the road is built, it will happen immediately upon the City’s signing on to the project. Nobody will buy a house knowing its value will only drop in the future, those living in those houses now will lose significant portions of their investments in them, and be given higher taxes in turn. Developers will no doubt profit by this fact, as their new houses on the outskirts will become THE places to live, leaving the “interior” around the Parkway lands to decline. This is one significant reason why other towns engaged in modern, sustainable municipal planning would never consider such a plan as it exists today but instead are engaged in revitalization projects green space initiatives and infrastructure renewal. For starters, the railway didn’t run through the park, the park grew up around the railway. When the tracks were installed in 1883, the park was nothing more than swamp and mostly clear-cut land. It was used for milling lumber and quarrying stone. When the land was bought by the Nichols family the railway right-of-way was not part of the deal. The tracks and land 10 feet out to either side of the roadbed was Grand Trunk property, which later became Canadian National property until sometime after the rails were removed in the early 1990’s when it was absorbed by the city. Once the city absorbed it into the park land, it became part of the park and as such subject to the same terms and conditions of which the surrounding land was granted to the city. The park as it exists today, was created out of nothing but hard work and community pride, and has been the crown jewel of Peterborough for decades. The rail traffic through the park consisted of passenger trains and freight. In either case, the consists were not at all the size of modern trains that stretch out for miles. These were relatively short trains by comparison that caused at most, 5 minutes disruption to the peace of the surrounding park as it passed. At the very height of rail traffic (half a century ago) there were several trains a day, and several 5 minute interruptions. All of which if added up would cumulatively equal about an hour of disruption in any given day, and 23 hours of peace and quiet. There is absolutely no logical comparison between this, and a high volume roadway which will see traffic through the area 24-7, not to mention pollution (including noise and light pollution) on a scale several times that of any freight train. The Park will lose all peace and quiet, wildlife will scatter, the place as we know it today will certainly be destroyed. I recently saw a picture of Parkhill Road as it crossed the creek and the railway tracks prior to the existing bridge. (Like the railway, Parkhill existed as an arterial route before Jackson Park was created) Regrettably, I never saw this in person as it was before my time. The image shows an idyllic scene, much the same as the stunning beauty we see elsewhere in the park. Today if you stand in the same spot as the former photograph, you see concrete piers, the valley half-filled with soil for an embankment, graffiti, and trash. This bridge “goes over” that part of the park also, (although technically the area in question is just south of the southern limit of the park). Nonetheless, the surrounding hillside and area is destroyed from what it was and will never be regained again. What will be the result of a bridge some 5 times bigger than the Parkhill bridge on the rest of the park? Save the money and engineering work on the elevated bridge, you may as well just plow the park under. The net result in the end will be the same. The polished images the public sees of the finished product, does not include the destruction required to put it there. Elevated bridges need piers, which require excavation, construction, footings, flow in and out of heavy equipment, etc. Where will the equipment gain access? On the existing park roads which will be clear cut and destroyed. 100 year old trees will be leveled to gain clearance. Yes they will grow back, but not in the lifetime of anyone reading this. I haven’t heard anyone talk about drainage either. Where will the thousands of gallons of rain water and snow run off that will accumulate on this bridge be drained? Into the already overtaxed sewer system? Into the creek? Not without significant changes. So say goodbye to the creek as you know it, its banks will be altered. There is simply no such thing as a bridge that can span a green space and not impact it. Anyone who thinks otherwise isn’t aware of simple physics (in particular, gravity), and the fact it will need to be supported from below. Once the project commences and the city sees the true cost of engineering and building such a structure, not to mention maintaining it, they will surely opt for the cheaper solution of filling in the valley beneath it just as was done with the Parkhill bridge. Finally, street lights will be required on this bridge. The park will be flooded with light at night, which will disrupt (and drive out) wildlife in the park. There is no way to keep the noise and light pollution up on the bridge and out of the park (or the surrounding neighbourhoods!). Don’t count on it. Projects like this are tendered out to existing firms with existing employees and sub-contractors. There are no requirements for the work to be done by local people. Jobs get awarded to companies with the lowest bid and best proposals. There are those who think projects like this should be taken on because building equals growth, growth equals jobs. While this may have been the case years ago, it no longer is the case today. The project will drain the community financially far more than it will help it. Peterborough wouldn’t be the first community that bankrupted itself thinking “if we build it, they will come”. Consulting firms that do assessments do so to make a profit and win business. Results from assessments can vary depending on who develops them. It’s not very difficult for a municipality to decide what they’re going to do ahead of time, and then find an assessment that justifies whatever decision they’ve already made. History shows the city has tried time and time again, and will keep trying (on the tax payers dime) until they find an answer that justifies their already formed decision. Seriously? Is any intelligent person expected to accept this as a reason to destroy the place? What on earth in Peterborough is so urgent to get to that 3 minutes matters? WalMart? Don’t say the Hospital, we’ve already established that time to get there from any direction is already more than acceptable. As already mentioned, Peterborough doesn’t have a traffic problem. Not even close. Any time spent in any community of similar size or larger will quickly prove this. Clearly, the arguments in favour of such a project are weak and uninformed. With two major floods (a result of insufficient sewer capacity) two years apart not even 10 years ago, it’s very obvious Peterborough cannot (or will not) maintain the already existing infrastructure. Municipalities today are replacing sewers with larger designs that exceed current municipal code rules for drainage, because those codes were written years ago and the climate has since changed. What happened in 2002 and 2004 are not isolated weather events, they are the result of what is becoming the new “norm” of weather patterns. If Peterborough has money to burn on redundant environmental assessments and this project, perhaps that money would be better spent on effecting REAL needed infrastructure upgrades. What about doing something to attract new business into dying malls like Portage Place and Peterborough Square, both once gems in Peterborough. How about spending some money to attract real jobs and industry in Peterborough so that young families can see it as a place to not only sleep, but to live and work and be able to afford to build themselves a lifestyle that past generations enjoyed, with a sense of pride in their community. What of the cost to maintain the Parkway once built? Where are the numbers that show what it will cost to maintain it year after year in perpetuity? If Peterborough can’t keep up with what it already has in place, then it has no business even thinking about this with the pending shifts in demographics already addressed above. Such a plan is not sustainable. And what of houses to be torn down to make way for this road, and those that have already been levelled? Is the city factoring in costs to properly remove asbestos and lead, which will be found in any one of those buildings given their age, prior to commencing demolition, including air quality samples analyised by laboratories to confirm a complete and thorough removal prior to demolition? Was this done for those already gone? Let’s see the documentation, since lawsuits from lead and asbestos contamination in the air are ugly and expensive, and contrary to environmental laws among other things. Keep in mind most common building materials used up until 1980 contained asbestos, demolition releases it in the air in large quantities. I hope there’s lots of responsible planning and transparency, and budgeted money for this as it can double or triple the cost of a demolition. Anyone living near a targeted demolition has reason to be concerned for their health, unless they live in a sealed bubble with an independent air supply. Peterborough doesn’t need the Parkway. Peterborough needs responsible governance, economic drivers, and real work (not minimum wage jobs) for young families. Peterborough needs to replace existing infrastructure that is desperately out of date and has already twice cost tax payers millions in damages as a result. Peterborough’s “Leaders” should be ashamed and embarrassed to drag out the flogging of the long dead horse that is the Parkway, over and over again, despite numerous democratic majorities telling them no, only to cultivate it into an expensive, time consuming and divisive debate that serves no productive purpose other than to rip at the very fabric of the community. All to feed the selfish desire of a minority to build a “legacy”. It will prove to be a legacy, although one of shame and poor decisions. The final failure of this plan is that the city has never provided an alternative, which is shameful if the “need” is indeed real. What would the costs or impact be to improve any one of the already existing and intended-to-be arterial routes? Nobody knows, because nobody has bothered to find out. The choice of the Parkway or No Way is not a choice, it’s an irresponsible act of holding the tax payers hostage and creating conflict in the community. In the end, everyone will lose. The Parkway is nothing more than an exercise in futility which will result in a golden road to nowhere, paid for by the tax payers and future generations to come.